This is an English repost of my thread in the German TLF forum. Updates can be found at the bottom of the post. Since then it has been my dream to combine this head with an LED to create, in terms of throw, probably the most extreme, classic LED flashlight (only one LED with reflector). Michael (tlf member RC-Drehteile, now here on BLF as RC-Lights, an experienced light builder who owns a lathe) kindly took on the project and really outdid himself! It was much more complicated and lengthy than anticipated, but now after around four months the light is finally finished! He went to a lot of effort to incorporate my numerous wishes and to withstand my growing impatience. I will go into a bit more detail on it here. Electroformed means that a precisely formed, negatively shaped mandrel, typically made of stainless steel, is coated with Nickel while sitting in a suitable electrolyte. The nickel electroform made this way then has all the shape- and surface features of the mandrel down to the smallest detail. This process enables a comparably cheap production with a repeatable, high precision. The especially precise (parabolic) shape allows for a large difference between the size of the light source and the size of the reflector. Normal flashlights don't usually require this to be considered because comparably speaking most LEDs are rather large. At some point it does become important though. The Maxabeam has a very small lightsource (the bright spot in the arc of the Xenon shortarc bulb has a diameter of around 0.125mm - 0.005in) and only produces its extreme luminous intensity due to the precise reflector used because only this way the entire surface of the reflector can be lit up by the small point (see this thread for an explanation). After the Nickel has been electroformed it is coated via electroplating or vacuum disposition. There are different materials for different purposes. The most common is probably aluminium because it's cheap and reflects 90% of visible light. The Maxabeams reflector is coated with the noble metal Rhodium. Rhodium coatings are considered the most robust because they are corossion resistant, very hard und are unsusectable to UV-radiation. Since the Maxabeam is meant for professional use in the military, where maritime use is very likely, the corrosion resistance to salt water was probably the primary reason for this coating. The main disadvantage of Rhodium compared to Aluminium is the lower reflectance of visible light (70-80%, see here). 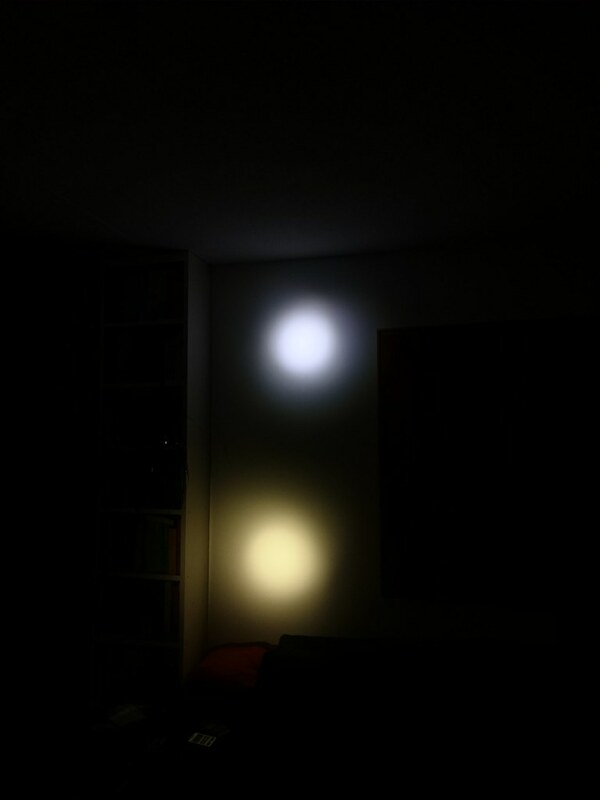 Part of my motivation to finally start the project this year was that there is finally an LED which is better for throwers than the old (de-domed) XP-G2 from 2012 - the Osram Black Flat Gen2 (LUW HWQP). I factored in how much light hits the reflector, the reflectors reflectivity, the UCLp lens and a small loss for heat with very good heatsinking. This is all based on the 790 LED lumens which djozz measured. Now to the likely most interesting value, which is actually rather easy to calculate (see here). Maximum possible luminous intensity when turning on the flashlight: 1,760,550cd (2,654m ANSI throw). To make it more realistic one could now subtract an additional 5-10% for the heating up of the LED. Many of you know that one cannot measure the true luminous intensity (throw) of a thrower in 1m distance if the value is supposed to be accurate. The reason for this is that in this distance in some lights the reflector is not completely lit up by the LED as seen from the sensor of the lux meter. One has to go further away and adjust the value for the longer distance. TLF member sma once studied this in more detail here. We both have the theory that it depends on the difference in size between the reflector and the LED. I have tried to calculate this for my light based on his results with an Olight SR-95 UT. I can't say how accurate these values really are. I don't know in what way the corners of the LED need to be taken into account. Theoretically they reduce the distance a bit (think about the hotspot size of lights with bulbs, the filament is basically just a slim glowing bar). To be able to have an understanding of the focus of this light beforehand I tried to calculate the spot size. For this one needs the following relation, which sma explained to me. It can be found in this wikipedia article on lenses, unfortunately there is no English version. One also needs the diameter of the light source and the maximum focal length of the reflector. Of course, for distances smaller than 11.8m this calculation is invalid. So the spot is very, very small for an LED light with reflector. These values need to be understood though! I did not account for the corners of the LED DIE and there is also a large corona around the hotspot because the reflector is so deep. I have only calculated the size of the part of the spot with maximum luminous intensity. I wanted the light to use a buck driver which is able to fully exploit the capabilities of the LED regardless of the battery voltage and which can deliver much higher LED currents to enable the light to be upgraded in the future with more powerful LEDs. Additionally I wanted an over discharge protection since the light would have multiple cells in series. Because the Ampere! driver itself can't really do anything except drive the LED, we combined it with the Stripe v4 Dimmer from the same company. It has the features I wanted, i.e. overdischarge protection, dimming with 1-2 electronic switches, connections for 1-2 status LEDs and multiple configuration options. There is even a new beta-firmware (v2.5), which offers the possibility of ramping (step-less dimming) with only one electronic switch. I wanted this. After a few starting difficulties we managed to flash it onto the dimmer. Part of the dimmers features can be conveniently configured via small DIP-switches, which we have set to the following configuration: 00011000 (1 = switch up). The "Akkuwächter" (overdischarge protection) was also activated, the light does not dim prematurely, the remaining charge level of the batteries is indicated by two status LEDs and the PWM frequency was upped from 200Hz to 2kHz. The new single-switch-ramping was also activated and works nicely with a dimming time of 3s (from 0 to 100%). During testing we noticed that unfortunately the driver produces a high-pitched whine whenever it is not at 100% or <10%. This makes the whole ramping thing a bit less fun, but just today I found out that there might be a fix. It also seems to ramp with linear current, since the brightness does not change linearly (making adjustment of low brightnesses more difficult). The voltage values of the "Akkuwächter" are also a bit outdated, they seem to be for older Li-Co cells which have high voltages when empty. The status LEDs say that the battery is empty when there is still 40% left in it. Luckily custom values can be set with help of the PC Software and and the separately available USB programmer. So yes, the driver and the dimmer do have some downsides, but they still have a ton of configurable features! The light was to be run with three 18650s in series for a good compromise between available energy and weight. The average of 11V would ensure a high compatibility with many different buck drivers in case a different one was ever needed. The battery runtime with 4,5A and a Vf of 3,7V with 90% driver efficiency and protected NCR18650GA cells should be around 2h without any form of dimming/step-down! Everything should feel like a production quality light. There were to be no small annoying things which I would always have to keep in mind when using the light. After the start of the project we really focused on the planning. Most of the light was planned in CAD. It was decided that the body would be made of multiple parts because otherwise it would be very difficult to connect the body to the head and mount the electronics inside. It was also decided that the batteries would need to be inside a specialized battery cage, which has both contacts on the same side since we couldn't have the current flow through the body. The reason for this is that the center solder pad of the Osram Black Flat is not electrically neutral and we wanted optimal heat transfer via a copper PCB which electrically connects both. The electronics were to be put into an insert or "sled" which gets put inside the middle part of the body. This insert would have screwholes for fastening it to the body and holes for the wires on the front side and connection plates for the springs of the battery carrier on the backside. As luck would have it I had the spare battery tube and battery carrier of my Magicfire Scorpion laying around. The battery carrier even has a mechanical switch in the back which is nice. Our alternative was the battery carrier of the Aceabeam K40, which would have been very expsenive as a spare part from China. After the general planning we started with the finer details like the outside design. After finishing most of the planning, Michael started making the body. He began with the copper rod for the LED. It has threads on the outside for heat transfer and focusing. It is wider at the top so that we could use a normal 16mm pcb and screw it down properly. The 11mm narrow reflector opening was not widened because of the danger of warping the reflector. This meant that the LED rod could only be inserted from the front, a delicate operation. The LED was then mounted. The leads go through two openings under the rim and then down through the hollow rod to the driver. Next up was probably the most important part - the connection piece between the head and the remaining body. Four sides were leveled to have a transition to the design of the head. Three M6 socket head screws were to connect it to the remaining body. The four screw holes for the connection to the head were then added. They go through the cooling fins. Thus this part of the body was finished and Michael continued with the electronics section. It was supposed to have knurling everywhere except for where the switch and status LEDs are. This didn't quite work out because this piece of the body was a bit too long for Michael's tool. Three flat sections were integrated to accomodate the electornic switches and status LEDs. The last large, outside part to be made was the endcap. It was supposed to be especially massy to make the light less top heavy. An opening with rubber boot for the mechanical switch of the battery carrier was also needed. The switch needed to be electrically isolated from the body. Now it was time to anodize the large metal parts since they were finished. The body was to be anodized black to match the head. For this the parts were first vibratorily finished to improve the surface and champfer the edges. Luckily Michael has built (and has experience with) an elaborate facility for this in his workshop. Subsequently the switch inserts were constructed. Michael made them in his own style, having done this previously. The two status LEDs got their own insert. To give the light some color the inserts were anodized in a light blue. The last part to be made was the insert for the electronics. First an aluminium disc was constructed which can be screwed into the front of the light, has openings for the LEDs leads and onto which the driver would be glued. A partly open plastic cylinder makes up the rest of the outer shape. The (way too large) dimmer was mounted into it. Massive copper contact plates for the springs of the battery carrier were put on the rear side. For higher corrosion resistance the contact plates were gold plated. Michael also does this himself! "Fun" fact on the side: 33 torx screws were used to build this light. This does not include the already present screws of the batterier carrier. This marked the end of the building phase. Now it was time for Michaels probably most annoying but at the same time most important work during this project - the optimal positioning of the LED in the focal point of the reflector in all three spacial dimensions. The calculation of the luminous intensity above already shows why this is so essential if one wants to fully make use of this reflector. Only when the LED is positions optimally the entire surface of the reflector will be lit up by the LED which leads to the maximum possible candela value (throw). Of course some of these sources of error were of theoretical nature since Michael fabricates metal pieces to a high degree of precision. At his first focussing attempts (at night after 11 PM since it gets dark rather late in the summer here and it needed to be done outside) he quickly started to grasp what degree of precision was actually needed. He positioned the lux meter in a distance of 12m and started turning the copper rod. He had already noticed during earlier tests that only in a very small range of the focus a useable spot was possbile. 0.3mm of rotation caused a change in luminous intensity from 914kcd to 1,371kcd! At this point he wasn't able to reach an even higher value causing some disillusionment. As it turned out though the body was not perfectly centered in relation to the reflector. Luckily Michael had thought of this beforehand and implemented some play in the screw holes to be able to adjust this a bit. In addition to this the LED pcb was not centered perfectly on the copper rod. Both problems were solved. During the final focussing session a luminous intensity of 1.543kcd was measured. This value made us happy, also because we improved on standing performance "records" of similar, optimized lights from wiestom89 and gaston01 by 50%. The copper rod was then fixated with a bit of threadlocker. Of course it is easier to somehow "beat" these values with a much larger reflector, but building an LED light that reaches the highest possible values for it's size in this type of light is time-consuming and difficult. As many of you know, optical measurements generally have relatively large tolerances since many different factors can influence them. Using a non-modded light measured according to ANSI-standards and made by a well known manufacturer, an Olight SR-52 UT, which has an XP-L HI LED with similar tint to the Osram Black Flat, Michael tried to reduce this uncertainty a bit. In addition to the similar tint this light has a perfectly regulated mid mode, in which the LED heats up much less compared to the highest mode. As it turns out, Michael's lux meter measured only 7/8 of the "real" value. The above values have been adjusted by +14.3% accordingly. Assuming that Olight only uses LEDs of a single Bin in this light a tolerance of +/- 6% would remain in addition to that of the lux meter itself. Numerous problems arose during the planning and building of this light. Here I want to go into a bit more detail on them and our "solutions". Here our solution was to test six LEDs and use the best of them. It should be noted that we only tested until what current each LED got brighter and how bright it got relative to the others. We forgot to write down values for each at the same current. All were mounted on the same type of pcb and on the same heatsink. The reflector needed to be cleaned under extreme caution. Luckily for us member sma anticipated this when cleaning his own Maxabeams and showed a seemingly safe method using soap foam which he even demonstrated in this Video. After sourcing the somewhat rare soap foam Michael was successfull in cleaning the reflector without damaging it. Tint of the LED turns very blue at 100% setting of driver which is a well known sign that it is getting too much current. When reducing the current just slightly the tint changes dramatically to a more normal cool white. Since this LED only gets brighter until 4.7A according to the above Test, we will reduce the current to 4.5A by switching out the sense resistor (the above candela values were measured at the maximum 4.7A with a lab power supply). Unfortunately the needed sense resistor (smd, 0805, 0.011Ohm, 0.5W) is currently hard to get here in Europe without paying horrendous shipping fees. Since the light is now finished, it is time to show it off " /> " />. I have already managed to do it. A real beamshot comparison can be found here. It really was an extremely extensive project! Even though we had to solve so many problems along the way, we still got an amazing, nicely working light as the end result. Because of the precision reflector and the extreme focus I think that in some ways it is a new category of LED thrower. I owe the whole thing to Michael who took on the project and saw it through the whole way! Update January 15th. 2018: The light has been repaired & improved. It now has an even better LED which increased the luminous intensity to 1.7Mcd. Details can be found in post 114. Wish I had more to say but, wow. Wow. What a read on one amazing light. The effort put into this I can only imagine. Thanks for the comprehensive write up and report. Well done to you both. I had no idea about the Q9WP/Q8WP, thanks for the info. Very impressive effort. Everything looks really clean; the machined driver section and the internals. The size is not too different from the BLF GT. This hobby is funny. As you noted, that beam is too narrow to be used for most purposes. We flashlight modders sometimes make lights and hope there is a purpose for them, rather than designing a light for a purpose. The original short-arc bulb in this reflector must also make a very small beam, right? What was its intended purpose? I had no idea about the Q9WP, thanks for the info. Q9WP is the older, less bright model. Q8WP is the newer, very interesting LED. Please send me a message if you ever find a reliable source for low quantities! I also calculated the spot size of the maxabeam with short-arc bulb above (in reality it’s a bit bigger because the arc is 3D and I only calculated the size of the brightest part of the arc on the tip of the anode). But yes, the beam is amazingly tight. Here is a longer list from the manufacturer. Thank you “The Driver” for the excellent presentation ! I build the light for him during the last 4 month and i am glad to see the result and the response here in BLF. Yup, I realized that and edited my post Confusing! I checked all distributors, nobody has them in stock. I assume it is because of how recent it is, the datasheet was just made in 2017. Use Octopart.com, it searches all distributors like mouser, digikey, arrow, and many others so you can save time without going to every site. “UW Q8WP” is what to search for, if anyone else wants to watch for it. What a fantastic post! It was great to read about the thoughts and challenges and then BAM! Such cool beamshots! An amazing build and I even learned a few things, though I must admit that most of the technical stuff is far above me. I am almost finished my build, just waiting on some liquid metal thermal paste. I have done some testing, it’s pretty interesting actually. If you take a piece of paper, poke 3 small holes in it, and put it in front of the reflector/lens of a flashlight you will get 3 separate squares (the die image) projected onto a wall. 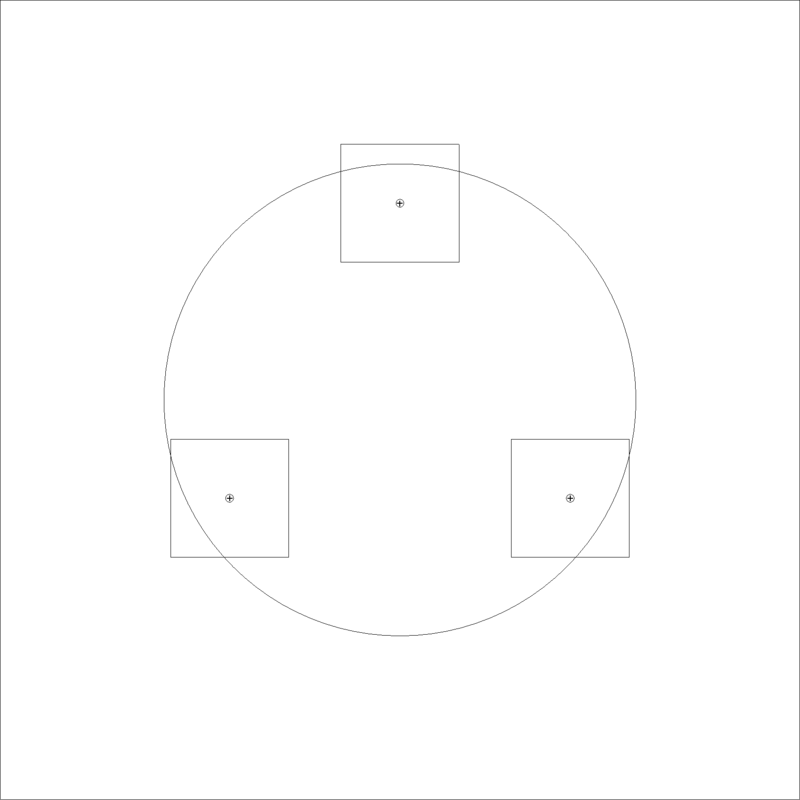 In “infinite focus”, which is what you want for ideal maximum throw, these three squares will be centered exactly at the 3 points. To get a proper lux reading when focused like this, the lux meter needs to be placed at the center, and the flashlight needs to be far enough away that all squares overlap in the middle, including the ones from the outer edges of the lens/reflector. However, with a focusable lens or reflector, you can actually change the focus and make all squares overlap at the luxmeter. When they are all overlapping is when you get the “sharp die projection” image. This allows you to take the measurement at a closer distance and get the same cd value when you calculate it back to 1m. You need to keep in mind though that focused at the luxmeter will not give maximum throw. It should be collimated using that template I posted above for best throw. For your flashlight, I calculated a minimum distance of 28.5m when it is collimated correctly. If you want to know how I calculated this stuff just let me know, I can make a separate topic explaining everything. To measure the maxabeam, I’m not sure how far it would need to be, because unlike an LED the small burning point is not all the same intensity like the surface of an LED is. That’s a neat method with the 3 holes in the paper, enderman. The condition that there is some overlap of all three squares is equivalent to all of the reflector area being used. Like if you looked straight into the reflector at that distance it would be filled with LED/light. I figured this out because you said that about looking into the reflector and seeing yellow. Hi and welcome Michael. I greatly admire your skills and abilities. You must be a very patient person. Very well done! From concept to application, brains to brawn as it were, and success in the end to make it all worthwhile! Michael, your machine work is excellent and I hope one day to be able to get at least in the ball park, still on the learning curve with the lathe and now in a long delay from surgery but very ready to get back out there! Mill work is beyond me for now, but obviously it’s the necessary other half to lathe work, combined there’s simply nothing you can’t accomplish and I love seeing it presented! Thank you both for all the effort , quality stuff right there! This must be the farthest throwing LED+reflector flashlight in existence right? 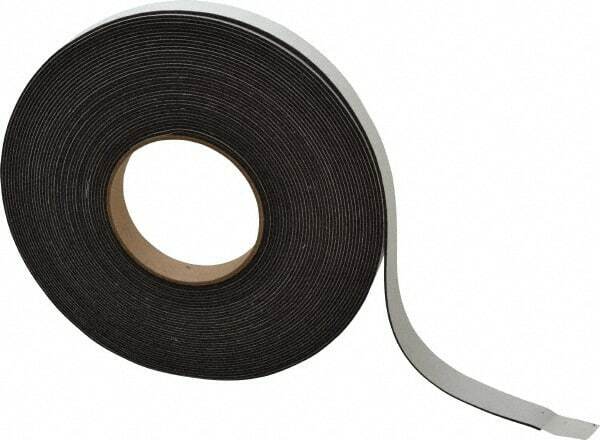 BTW to prevent your lenses from cracking in the future I would suggest buying some adhesive neoprene tape that’s 1/32 or 1/16” thick, then cutting a thin strip and putting that where the front bezel holds the lens. It basically acts like an o-ring, putting soft pressure that isn’t too concentrated, and it creates a waterproof seal. It has adhesive on only one side, so it won’t stick to the lens and make it hard to open. If you want you can also put some on the other side of the lens, so that the edges of the lens are sandwiched between two layers of foam. Very nice project and a great write-up. Great job, Michael and The_Driver! Amazing build , nice nighttime bomber searchlight! So it is 1,5 milion candela reflector light and once when we’ll have commercial available LE UW Q8WP Osram emitters it will even surpass that results. I am blown away by this. simply wow. Very nice outcome, & I enjoyed the detailed build post. I can appreciate how difficult it is to focus such a large reflector on such a small point! 1 what is the depth of the reflector /or/ depth led mounted inside the reflector from the top? 2 what is this black thing in the center of the lens? The LED is a 3V one right? Why choose this complicated driving engine? Can you / do you want to give an estimate on the costs of this monster? Thanks for the tip, we will take a look ;). As far as I know this is the farthest throwing portable led flashlight which has a single LED with a reflector. Thats also what I meant when I wrote that it’s a lot of work and rather difficult to reach even higher values with this kind of light. The farthest throwing led flashlight with multiple LEDs and reflectors is Lumensteins Lux Monster” from Xandre. It is much, much bigger though (plastic spotlight host)! 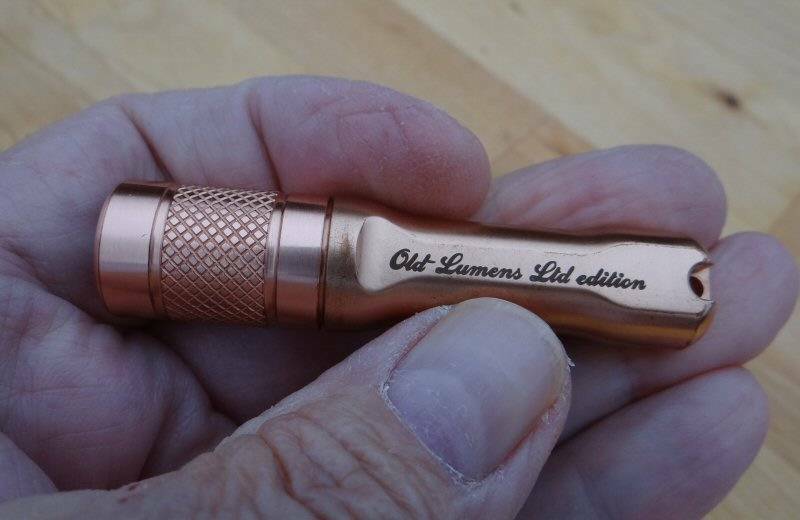 With around 6000 lumens it is also more practical, the spot is much bigger. It used to have de-domed XP-G2s and produced 2Mcd with 2000 lumens. Now it does 1.6Mcd with 6000 lumens. The farthest throwing portable LED “flashlight” is Photons “Scheinwerfer”, it has a very large spheric lens and does 3Mcd.